Tom McWeeney has been working in the comics industry since the 1980s. Besides writing and drawing Roachmill, he’s probably best-known for a very wacky, three-issue run on Teenage Mutant Ninja Turtles (#38-40). But, before all that, he was caught up in the adventures of Marvel’s rampaging, green behemoth. 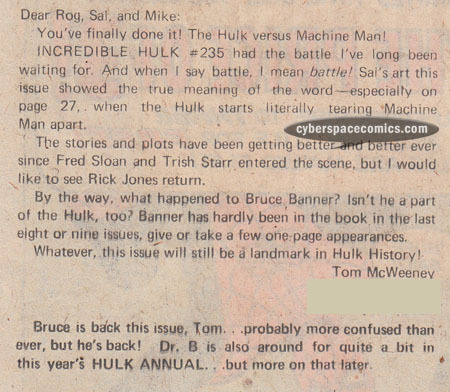 He got a letter published in the Incredible Hulk #240 (cover date – October 1979) which you can read below.